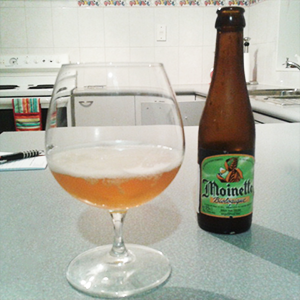 The final beer before I embark on my Dry July crusade is this saison from Belgium; Moinette Biologique. I possibly overindulged on the previous night so it was rather late in the day before I really felt like having my final beer. I wasn’t too enthusiastic at the thought, so I ended up just picking the smallest bottle I had in the fridge. On the plus side I was quite looking forward to trying this beer as I am a big fan of saison beers. Moinette Biologique poured a clear golden yellow with a good head that died away pretty quickly (I think I need to give my beer glass a better clean). On the nose the beer had notes that were spicy, funky and yeasty; all the things you would want from a saison. The flavours in the glass were bold and spicy with heavy carbonation that helped it to finish dry… just like the coming month. In case you missed the memo, Dry July started today, the campaign aims to directly benefit adult cancer patients with real and tangible change by providing funds to create better environments and support networks for patients and their families as well as raise awareness of drinking habits and the value of a balanced healthy lifestyle. We’re all bound to know someone suffering from cancer so please give generously this July while I give up my favourite beverage and pastime.